The delightful style of the Joan Rain Wedge Tall boot by SOREL will have you dancing in the rain and jumping in every puddle you find! Waterproof vulcanized rubber upper. Air mesh lining for breathability. Removable molded EVA footbed is perforated for a breathable walking experience. Mesh insole topcover for moisture evacuation. Vulcanized rubber midsole for stability and support. Rubber-covered wedge. Molded rubber outsole with siping and specific compound for wet traction. Imported. Measurements: Heel Height: 3 in Weight: 1 lb 14 oz Circumference: 16 in Shaft: 14 in Product measurements were taken using size 7, width B - Medium. Please note that measurements may vary by size. Weight of footwear is based on a single item, not a pair. 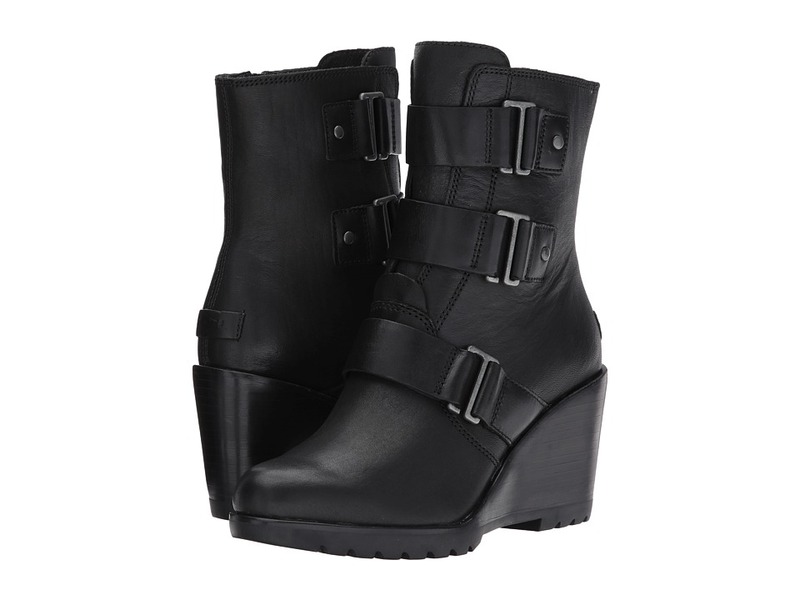 Dance in the rain and jump in the puddles with the flawless Joan Rain Wedge boot by SOREL. Waterproof vulcanized rubber upper. Air mesh lining for breathability. Removable molded EVA footbed is perforated for a breathable walking experience. Mesh insole topcover for moisture evacuation. Vulcanized rubber midsole for stability and support. Molded rubber outsole with siping and specific compound for wet traction. Imported. Measurements: Heel Height: 3 in Weight: 1 lb 7 oz Shaft: 6 1 2 in Product measurements were taken using size 7, width B - Medium. Please note that measurements may vary by size. Weight of footwear is based on a single item, not a pair. 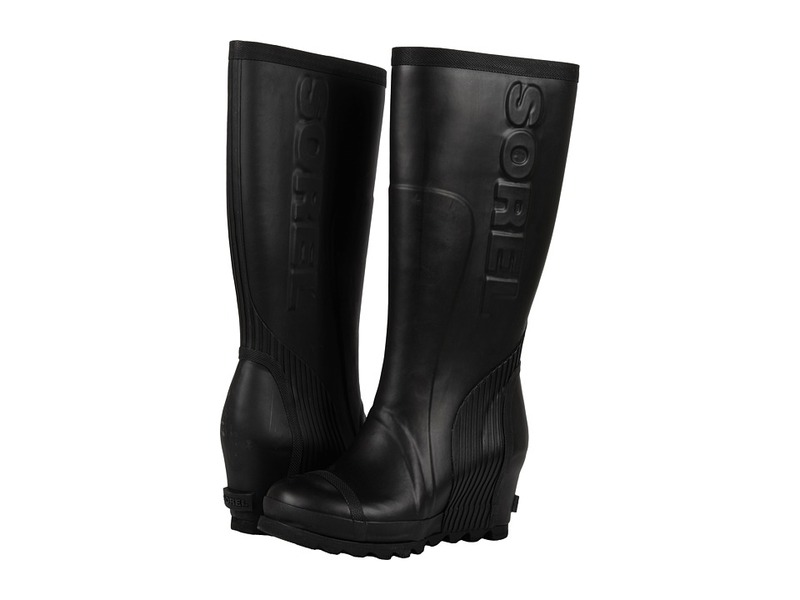 Take on the biggest puddles as you dance in the rain with this flawless rain boot by SOREL. Waterproof vulcanized rubber upper in a pull-on construction. Mesh lining for breathability. Removable molded EVA footbed is perforated for a breathable walking experience. Mesh topcover for moisture evacuation. Vulcanized rubber midsole for stability and support. Molded rubber outsole with siping and specific compound for wet traction. Imported. Measurements: Heel Height: 1 in Weight: 1 lb 4 oz Circumference: 14 in Shaft: 9 in Product measurements were taken using size 7, width B - Medium. Please note that measurements may vary by size. Weight of footwear is based on a single item, not a pair. 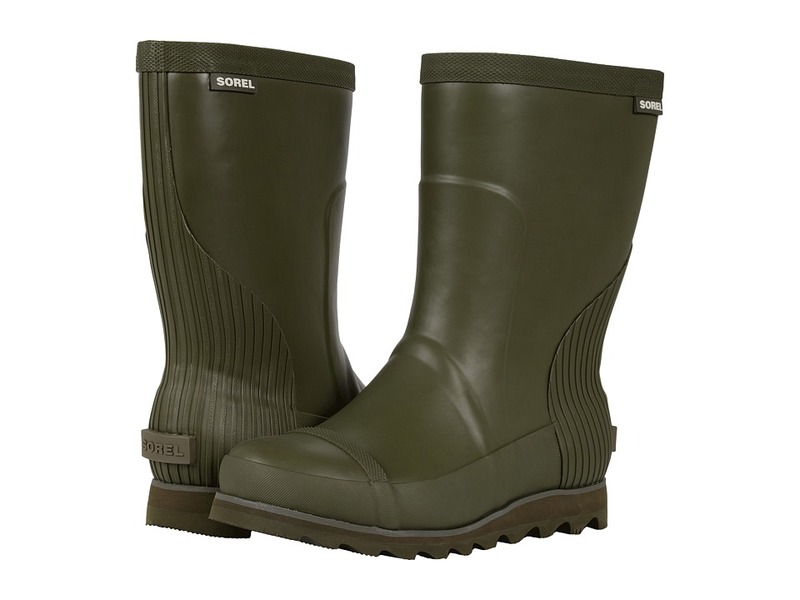 The wet weather will never slow you down with the stylish Out ~N About Rain boot from SOREL! 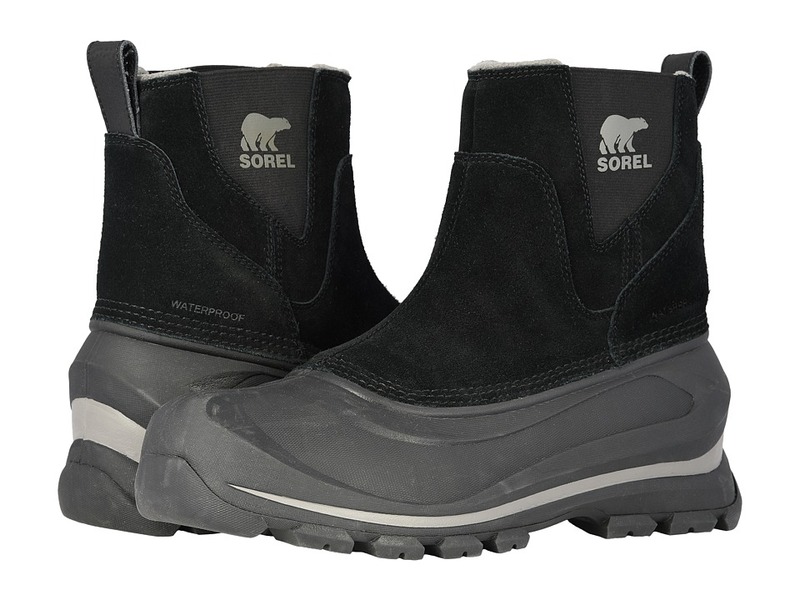 Sorel states this style runs small and recommends ordering a full size up. Ex. If you~re a regular size 8 then order a size 9. Waterproof patent leather upper. Best for: heavy rain Easy lacing system for a secure fit. 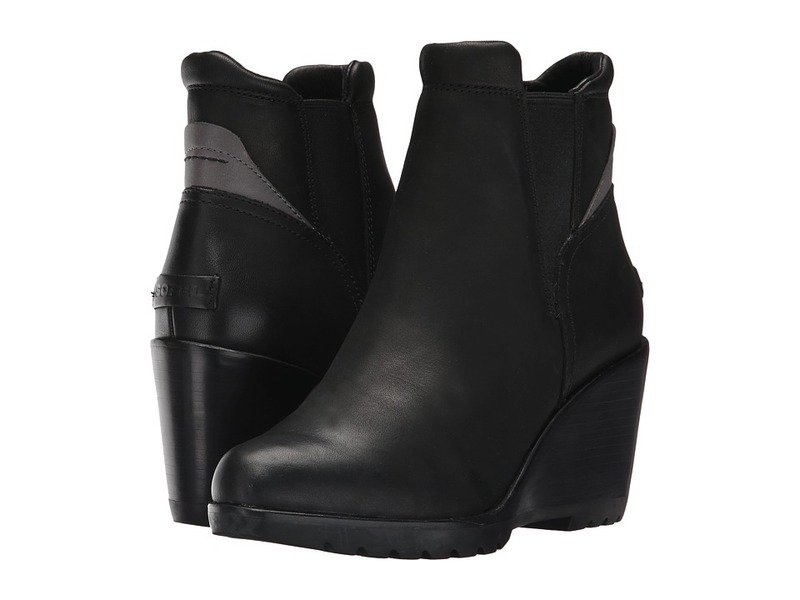 Seam-sealed bootie construction keeps out the wet elements for a drier, more comfortable foot environment. Canvas lining for added breathability. Removable molded EVA footbed with cotton top cover for added comfort. Vulcanized rubber midsole for long-lasting support. Handcrafted waterproof vulcanized rubber shell with herringbone outsole provides excellent waterproof protection and superior traction on various surfaces. Imported. Measurements: Weight: 13 oz Product measurements were taken using size 7, width B - Medium. Please note that measurements may vary by size. Weight of footwear is based on a single item, not a pair. 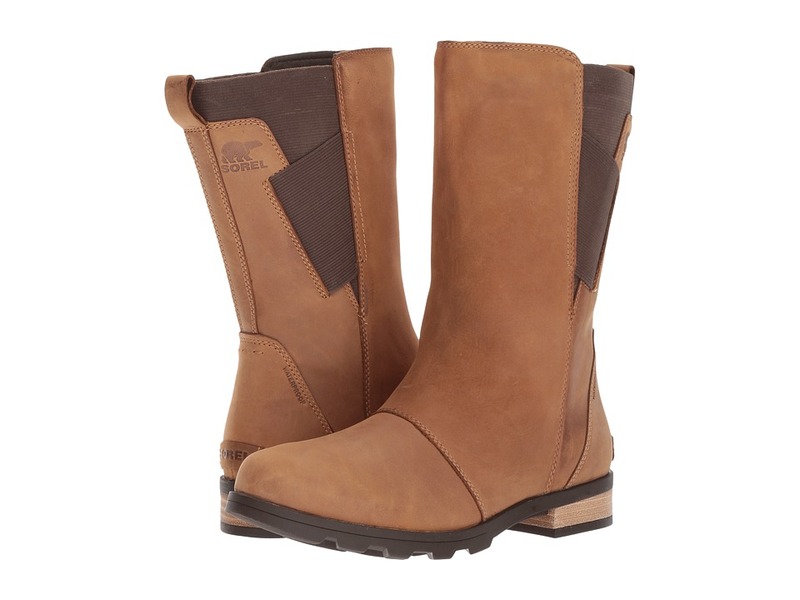 The Sorel Buxton Pull On boot provides the ideal warmth and protection to keep you comfortable all season long. Waterproof suede leather and textile upper. Side gore V-panel for easy on and off. Seam-sealed waterproof construction. 200g insulation for added warmth and protection. Breathable textile lining. Removable EVA footbed with breathable textile top cover. 2.5 mm bonded felt frost plug. Injection-molded, waterproof thermal-rubber shell. Durable rubber outsole. Temp rated: -25&amp#176 F/-32 &amp#176C Imported. Measurements: Weight: 1 lb 12 oz Shaft: 7 1 2 in Product measurements were taken using size 11, width D - Medium. Please note that measurements may vary by size. Weight of footwear is based on a single item, not a pair. 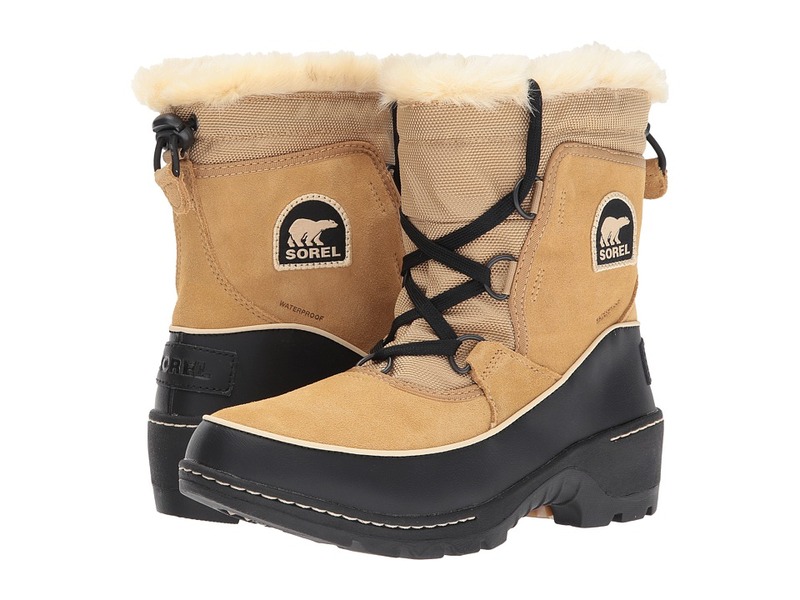 The SOREL After Hours Bootie offers long-lasting style in all kinds of weather. Please note that this style is running small and the brand recommends ordering a half size larger than your normal size. EX: If you are a size 7 order the 7.5 size. Waterproof full grain leather upper. Three buckle accents for a moto-inspired look. Side zip closure for easy on and off. Leather and microfiber lining. Die cut memory EVA footbed with pigskin top cover for added comfort. Molded BPU wedge midsole with EVA insert in forefoot. Leather wrapped heel. Molded rubber outsole for excellent traction. Imported. Measurements: Heel Height: 3 in Weight: 1 lb 3 oz Circumference: 11 in Shaft: 8 in Platform Height: 3 4 in Product measurements were taken using size 7.5, width B - Medium. Please note that measurements may vary by size. Weight of footwear is based on a single item, not a pair. The SOREL After Hours Chelsea offers long-lasting style in all kinds of weather. Please note that this style is running small and the brand recommends ordering a half size larger than your normal size. EX: If you are a size 7 order the 7.5 size. Waterproof full grain leather or suede upper. Material type is stated in color name. Side gore panels for easy on and off. Leather and microfiber lining. Die cut memory EVA footbed with pigskin top cover for added comfort. Molded BPU wedge midsole with EVA insert in forefoot. Leather wrapped heel. Molded rubber outsole for excellent traction. Imported. Measurements: Heel Height: 3 in Weight: 1 lb 1 oz Circumference: 11 in Shaft: 6 in Platform Height: 1 2 in Product measurements were taken using size 8.5, width B - Medium. Please note that measurements may vary by size. Weight of footwear is based on a single item, not a pair. 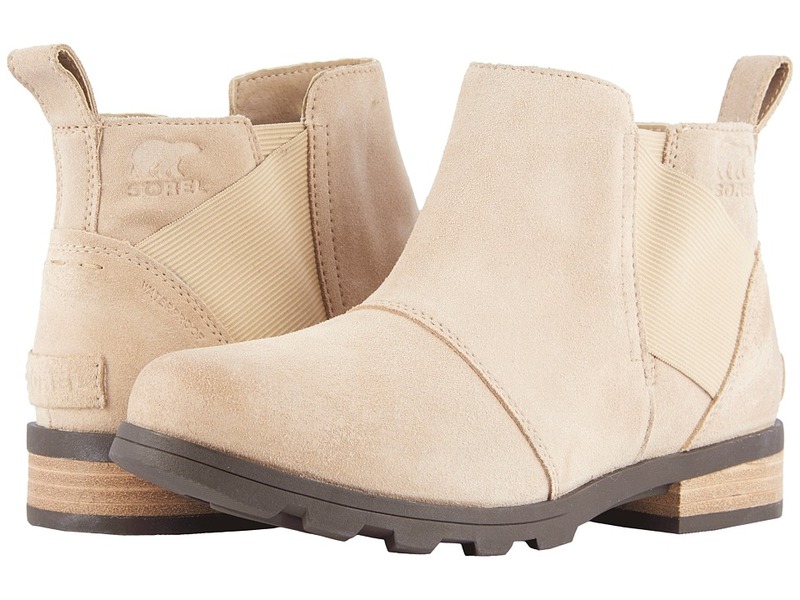 The SOREL PDX Wedge will have you in style and steady on your feet both in the country and on the city streets. Waterproof full grain leather and coated canvas upper. Traditional lace-up system with sturdy metal eyelets for a secure fit. Soft synthetic lining for a comfortable in-shoe feel. Removable molded EVA footbed with heel cup and arch support with a synthetic top cover. Molded BPU-PU wedge. Molded rubber outsole. Imported. Measurements: Heel Height: 3 in Weight: 1 lb Shaft: 5 in Platform Height: 1 4 in Product measurements were taken using size 8.5, width B - Medium. Please note that measurements may vary by size. Weight of footwear is based on a single item, not a pair. 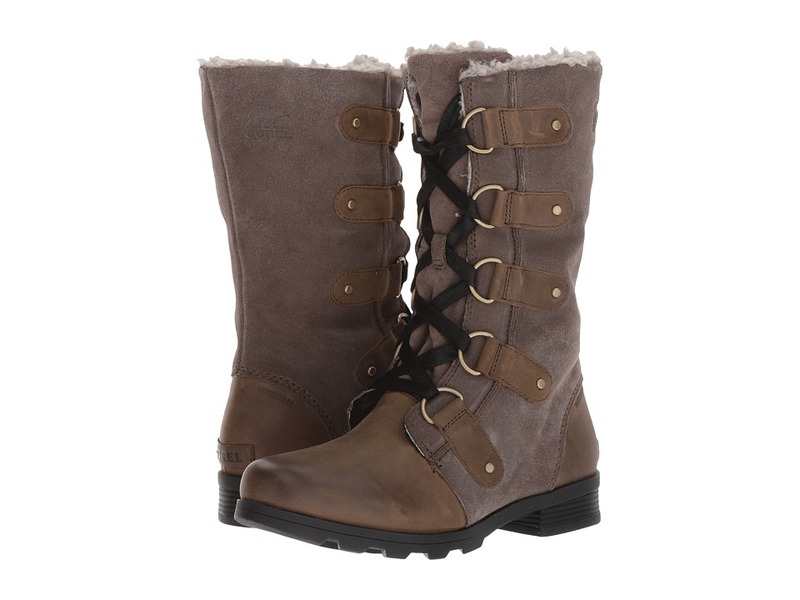 The chic yet protective style of the Dacie Lace boot from SOREL will have you walking tall all season long. Waterproof leather upper. Lace-up system for a secure fit. Genuine shearling and leather cuff for added warmth. Real Fur: Dyed sheep shearling from Australia. Cozy microfleece lining to keep the chill out. Die-cut memory EVA footbed with a leather top cover for an incredibly supportive and comfortable fit. Molded rubber midsole provides added support and shock absorption. Sturdy molded rubber heel. Handcrafted rubber outsole with herringbone design for excellent traction. Imported. Measurements: Heel Height: 3 1 2 in Weight: 1 lb 3.8 oz Shaft: 6 in Product measurements were taken using size 8.5, width B - Medium. Please note that measurements may vary by size. Weight of footwear is based on a single item, not a pair. 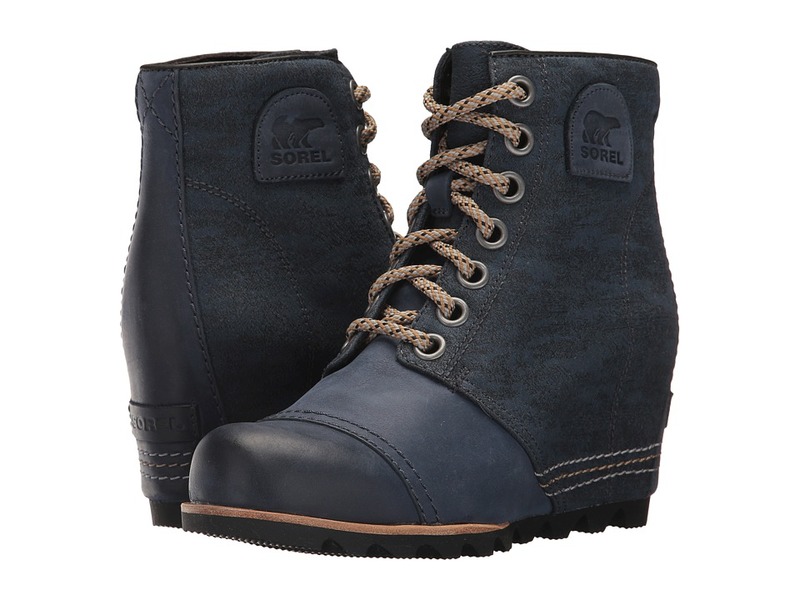 Keep out the cold with the signature style and protection of the SOREL Emelie Tall Premium boot! Equestrian-inspired silhouette. Uppers of waterproof full-grain leather and suede. Seam-sealed waterproof construction. Faux-fur collar. Canvas and synthetic lining. Removable memory EVA footbed with microfleece top cover. Rubber midsole. Molded rubber outsole with leather wrapped heel. Imported. Measurements: Heel Height: 1 1 4 in Weight: 1 lb 6 oz Circumference: 15 in Shaft: 15 1 2 in Product measurements were taken using size 8, width B - Medium. Please note that measurements may vary by size. Weight of footwear is based on a single item, not a pair. 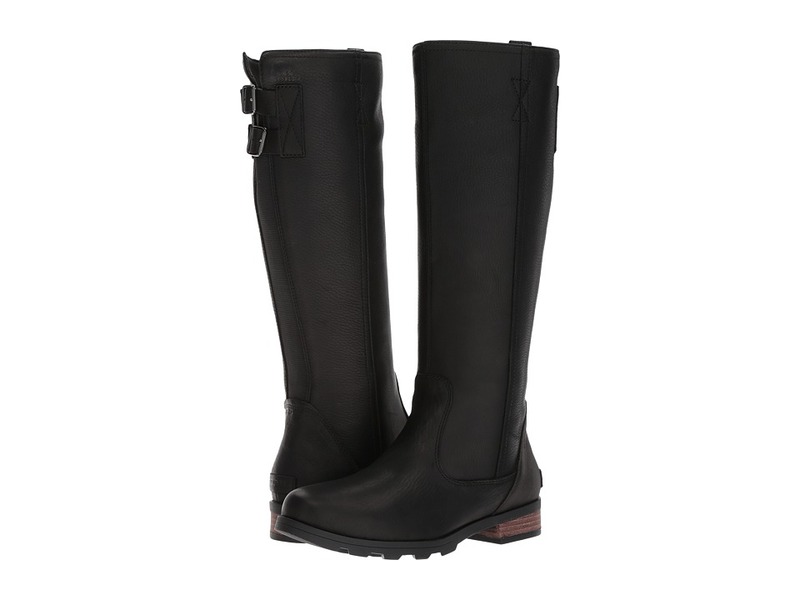 The lux look of the SOREL Emelie Mid boot will keep you looking and feeling good even on the rainiest of days! Waterproof full grain leather upper. Seam-sealed waterproof construction keeps out the wet elements for a drier, more comfortable foot environment. Canvas and synthetic lining for added comfort. Removable memory EVA footbed with a microfleece topcover for added cushioning. Durable rubber midsole provides reliable shock absorption and support. Leather wrapped heel. Molded rubber outsole for long-lasting durability and grip. Imported. Measurements: Heel Height: 1 1 4 in Weight: 1 lb 1 oz Circumference: 13 1 2 in Shaft: 10 in Product measurements were taken using size 8.5, width B - Medium. Please note that measurements may vary by size. Weight of footwear is based on a single item, not a pair. The lux look of the SOREL Emelie Chelsea boot will keep you in style all season long in all kinds of weather. Waterproof full grain leather upper. Seam-sealed waterproof construction keeps out the wet elements for a drier, more comfortable foot environment. Canvas and synthetic lining for added comfort. Removable memory EVA footbed with a microfleece topcover for added cushioning. Durable rubber midsole provides reliable shock absorption and support. Leather wrapped heel. Molded rubber outsole for long-lasting durability and grip. Imported. Measurements: Heel Height: 1 in Weight: 14 oz Circumference: 12 in Shaft: 5 in Product measurements were taken using size 8.5, width B - Medium. Please note that measurements may vary by size. Weight of footwear is based on a single item, not a pair. If you feel like dancing or singing in the rain, the Emelie Lace Premium boot is the way to do it! 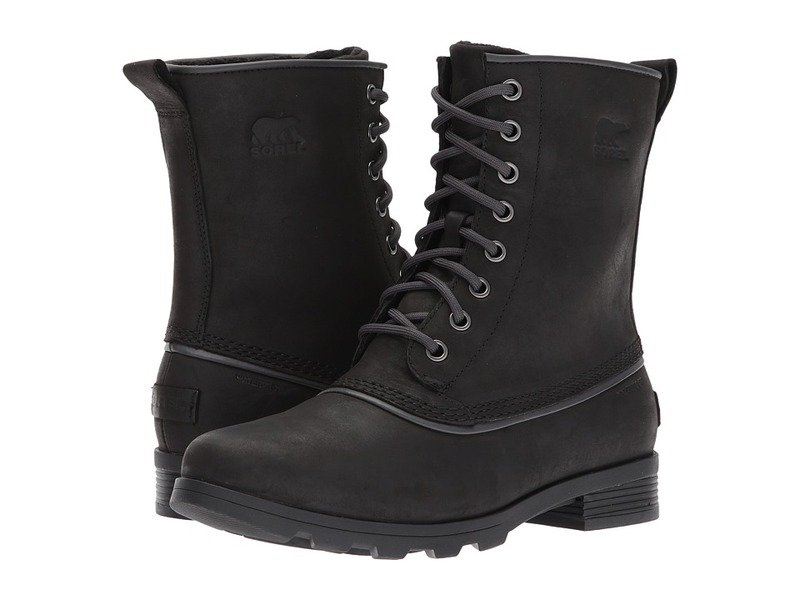 Waterproof full grain leather and suede upper in a seam-sealed waterproof construction. Lace-up closure for an adjustable and secure fit. Faux fur collar can be left up or folded down for two different looks. Canvas and synthetic lining. Removable memory EVA footbed with a microfleece top cover. Supportive rubber midsole. Leather-wrapped heel. Molded rubber outsole. Measurements: Heel Height: 1 1 4 in Weight: 1 lb 4 oz Shaft: 10 in Product measurements were taken using size 8, width B - Medium. Please note that measurements may vary by size. Weight of footwear is based on a single item, not a pair. The SOREL Emelie Lace boot has a chic silhouette and a comfortable fit that will keep you looking and feeling good even on the rainiest of days. Waterproof full grain leather and suede upper. Faux-fur collar for added warmth and style. Seam-sealed waterproof construction keeps out the wet elements for a drier, more comfortable foot environment. Traditional lace-up system for a secure fit. Canvas and synthetic lining for added comfort. Removable memory EVA footbed with a microfleece topcover for added cushioning. Durable rubber midsole provides reliable shock absorption and support. Rubber-wrapped heel. Molded rubber outsole for long-lasting durability and grip. Imported. Measurements: Heel Height: 1 1 4 in Weight: 1 lb 5 oz Shaft: 11 in Product measurements were taken using size 8.5, width B - Medium. Please note that measurements may vary by size. Weight of footwear is based on a single item, not a pair. The SOREL Emelie 1964 boot has a chic silhouette and a comfortable fit that will keep you looking and feeling good even on the rainiest of days. Waterproof full grain leather upper. Seam-sealed waterproof construction keeps out the wet elements for a drier, more comfortable foot environment. Traditional lace-up system for a secure fit. Canvas and synthetic lining for added comfort. Removable memory EVA footbed with a microfleece topcover for added cushioning. Durable rubber midsole provides reliable shock absorption and support. Rubber-wrapped heel. Molded rubber outsole for long-lasting durability and grip. Imported. Measurements: Heel Height: 1 1 4 in Weight: 1 lb 1 oz Shaft: 7 1 2 in Product measurements were taken using size 9, width B - Medium. Please note that measurements may vary by size. Weight of footwear is based on a single item, not a pair. 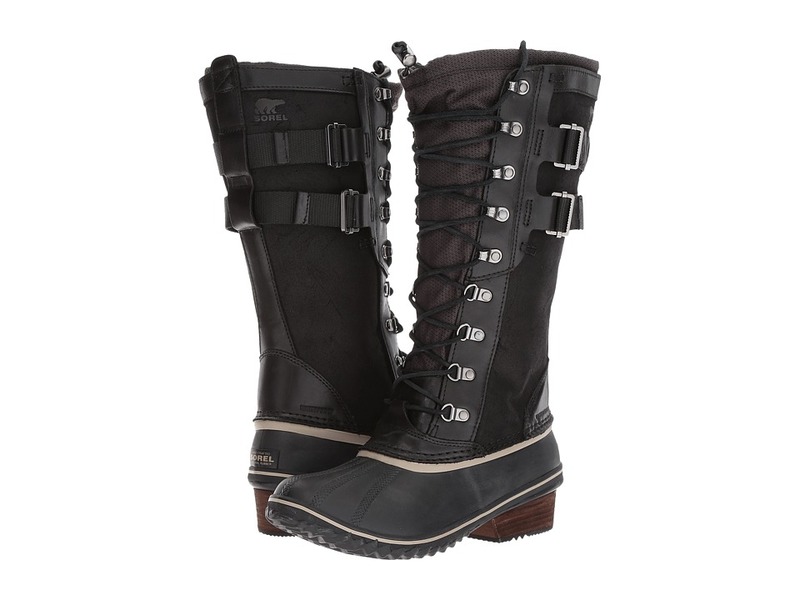 The Sorel Conquest Carly II boot will make sure that you are ready for the cold-weather adventures this season. Waterproof full grain leather, suede, and canvas upper. Full length gusset construction with bungee and lace closure for a secure fit. Seam-sealed construction keeps out the wet elements. 100g insulation with soft jersey lining. Molded EVA footbed with arch support microfleece topcover. Vulcanized rubber midsole. Leather-wrapped heel. 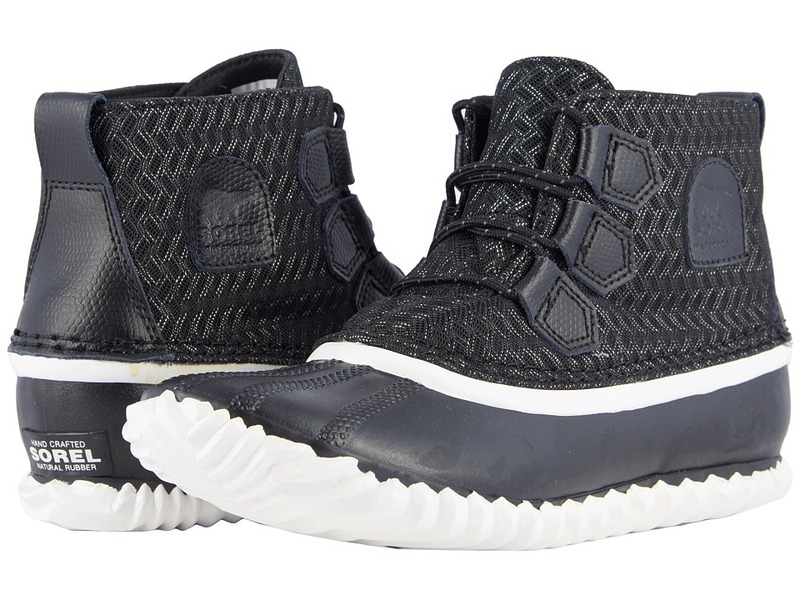 Insulated waterproof vulcanized rubber shell with herringbone outsole offers excellent traction. Imported. Measurements: Heel Height: 1 1 2 in Weight: 1 lb 11 oz Circumference: 14 in Shaft: 13 1 2 in Platform Height: 1 4 in Product measurements were taken using size 9, width B - Medium. Please note that measurements may vary by size. Weight of footwear is based on a single item, not a pair. 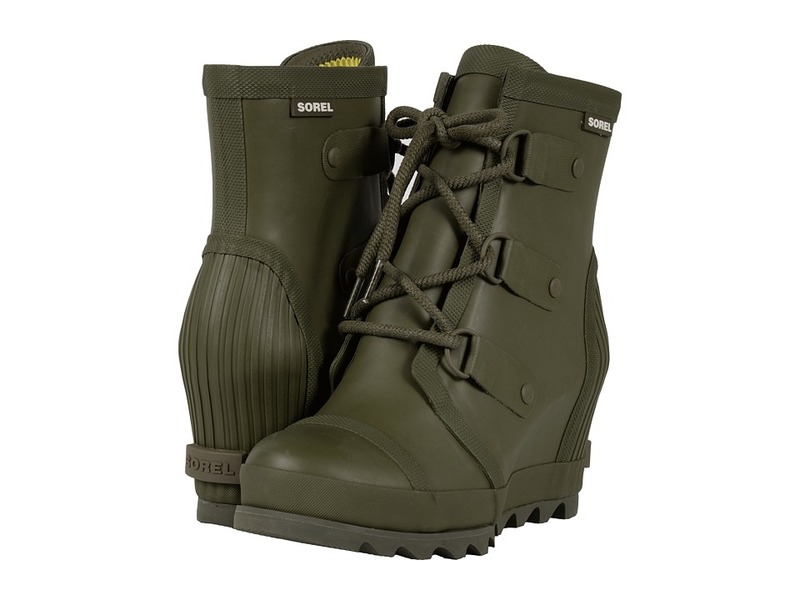 The stylishly durable Out N About boot from SOREL will have you looking smart on those damp days! Waterproof textile upper. Easy lacing system for a secure fit. 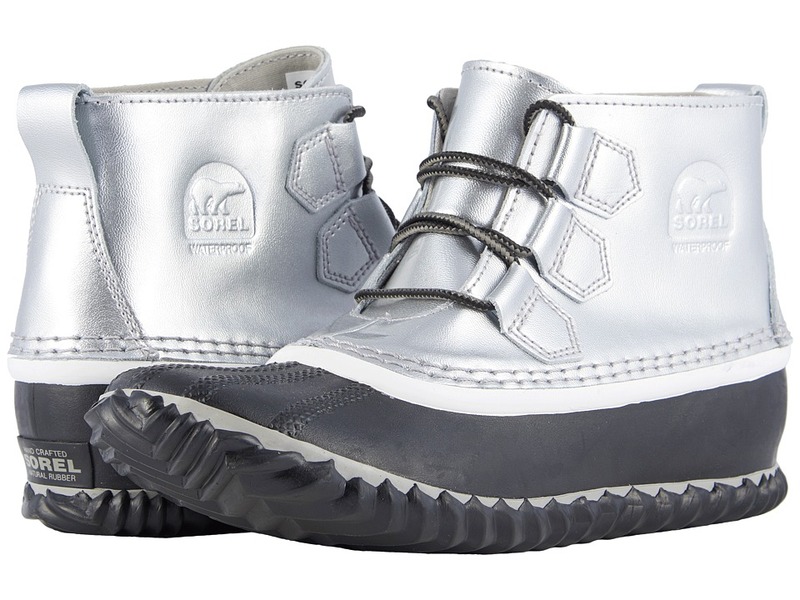 Seam-sealed bootie construction keeps out the wet elements for a drier, more comfortable foot environment. Canvas lining for added breathability. Removable molded EVA footbed with cotton top cover for added comfort. Vulcanized rubber midsole for long-lasting support. Handcrafted waterproof vulcanized rubber shell with herringbone outsole provides excellent waterproof protection and superior traction on various surfaces. Imported. Measurements: Weight: 13 oz Product measurements were taken using size 8.5, width B - Medium. Please note that measurements may vary by size. Weight of footwear is based on a single item, not a pair. Subtle design changes make the Tivoli III more feminine yet just as functional. Waterproof suede and nylon uppers. Traditional lacing with D-ring hardware for a secure fit. Features both 100g Thinsulate and a full fleece lining to keep the cold out in the most frigid temperatures. Waterproof breathable membrane construction keeps out the wet elements. Microfleece topcover over a removable EVA footbed provides cushioning, warmth, and support for all-day comfort. Rubber midsole offers added comfortable support. Molded rubber outsole, inspired by the classic 1964 Pac boot, gives excellent traction that you need in the slick terrain. Imported. Measurements: Heel Height: 2 in Weight: 1 lb 2 oz Circumference: 14 in Shaft: 7 in Product measurements were taken using size 7.5, width B - Medium. Please note that measurements may vary by size. Weight of footwear is based on a single item, not a pair.